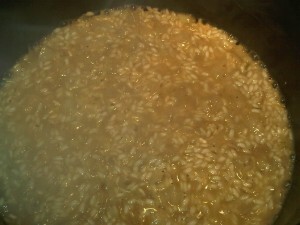 It is important that once the rice is added that the rice be constantly stirred. Do not leave it to cook without stirring or the result will not be as good as it can be. 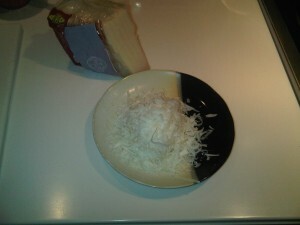 Stirring brings out the creaminess in the rice. 1. 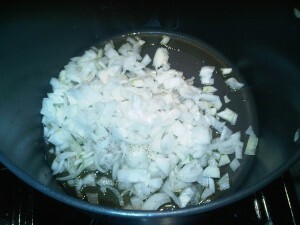 Over medium high heat, add oil and sauté chopped onions until soft, stirring often. 2. Add pepper and salt and continue stirring. Steps 4 to 5 will be repeated for about 20 minutes until all of the liquid is used. 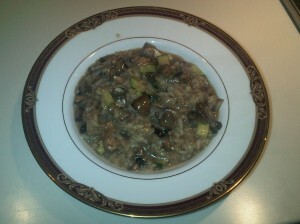 The final result should be a creamy, wet rice mixture. 4. 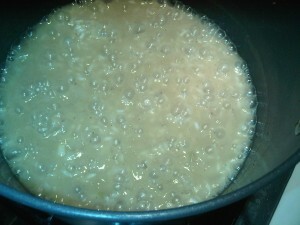 Add ½ cup stock, stirring constantly and allow the liquid to be absorbed into the rice. 5. 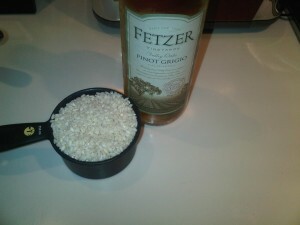 Add ½ cup wine, stirring constantly and allow the liquid to be absorbed into the rice. 6. 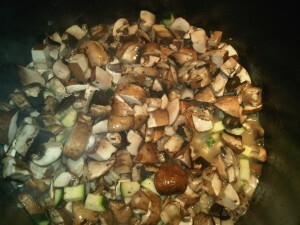 Stir in mushrooms and zucchini and continue stirring.